Of all the new races that have been added to the Formula 1 calendar in the last 15 years or so, only two have really cut through to establish themselves as something special. One is the US Grand Prix in Austin, Texas; the other is Singapore. Each one has that certain je ne sais quoi that lifts them out of the humdrum and makes them exceptional. As far as Singapore goes, it's no surprise it has become second only to Monaco as the place where most business gets done over a grand prix weekend. It's a place you just really want to go. That message permeates, and has made it into one of the most desirable races on the calendar. For a start, the ambience is terrific - and, let's be honest, this is what appeals to the business visitors, rather than the demands of racing on one of the longest tracks in F1 in crippling humidity. Singapore is a fascinating destination full stop, thanks to its place at the crossroads of south-east Asia and colonial past. But hosting the race at night adds an extra dimension. The track jags through the city centre under lights, Chinese lanterns adding a dash of colour, the futuristic city skyline the backdrop. As the sun sets, the whole place seems to shimmer and sparkle for a while. Darkness takes the edge off the tropical heat, and a heady, luscious tropical atmosphere settles over the place. For those working at the race, there's a surreal edge to it, too. First track sessions at dusk, qualifying and race after dark means staying on European time. So you wake up at 2pm, finish work in the early hours and go to bed at six in the morning. You can eat in a hotel restaurant, some of which stay open all night for the race weekend. Better, though, to head to an all-night hawkers' market, where delicious, cheap local food is on offer from a myriad of stalls and you can drink in the atmosphere of the place. Oh, and the track is pretty good, too. 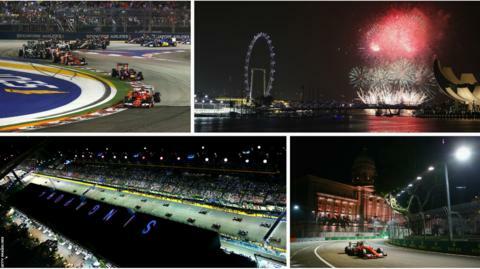 It's no Spa or Suzuka, but the Marina Bay Circuit has a challenge all of its own. A long, long lap, a nearly two-hour race, bumps, 23 corners and intense humidity make it arguably the toughest grand prix on the calendar - only Malaysia comes close. Add it all up and it's a race not to be missed. Remember this intrepid explorer? At last year's race, a spectator managed to clamber on to the home straight and miraculously avoided creating a health and safety nightmare. Sebastian Vettel described the man as "crazy"
Nico Rosberg has taken maiden victories at Bahrain, Baku, Monza, Sochi and Spa this season - can he get his first in Singapore? Not for the first time this season, Lewis Hamilton made a bad start in his last race - the Italian Grand Prix. Can he avoid a shaky start in Singapore?